So, the original idea here was to talk about how Ocotillo plants (Fouquieria splendens) in bloom seem to host bird or pollinator visitors at almost any time of day. It seemed like a good idea to do at least one random sample of observation before declaring this. 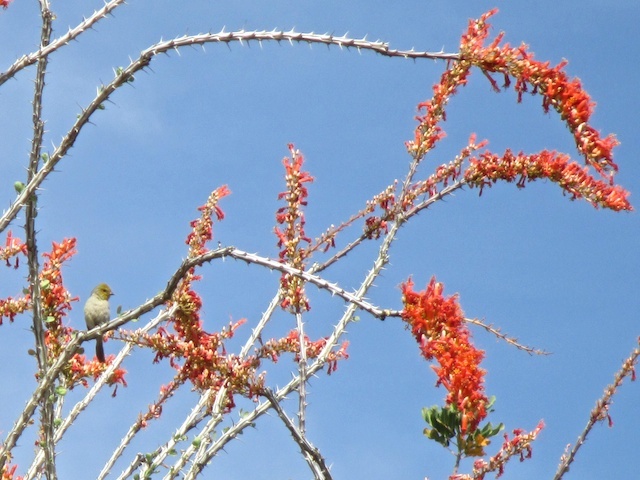 And sure enough, during a 3 minute segment one spring afternoon, a few days into full bloom for the ocotillo, there were two bird visitors and several pollinator insects. Now this was just one casual observation, but it indicates how often you see creatures near or on these plants. As noted in an earlier post, Verdins, (Auriparus flaviceps) the very small birds with yellow heads, are frequent visitors, apparently looking for insects. Finches are also common. And hummingbirds can be seen throughout the year. It is amazing that any birds can find a firm foothold on the thorny stems. Clever feet. Remember that the ocotillo is not a cactus, although it may look like one during some parts of the year. It’s in a completely different group. In fact, for most of the year, it looks like a bundle of dead sticks, and if you first saw one for sale in a garden center, you might wonder what they were trying to sell.